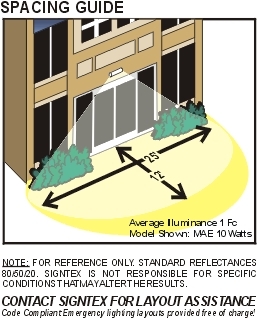 MAE Series - Architectural Exterior - Signtex Lighting Inc.
A dramatic new and compact architectural design, providing powerful emergency and normal lighting for over-door and other exterior locations. enamel or anodized finishes, with rugged sealed diffuser lens and stainless hardware, for universal wall or ceiling mount. • Extremely low profile, formed aluminum housing. Standard finish is white satin paint; custom colors are available, including brushed aluminum anodized finishes. • Wet location listed IP66. 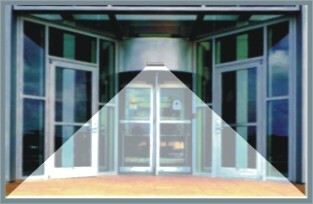 • Uniform elongated lighting pattern over required path of egress. BB= Unit equipment with self-contained battery. RE= Remote for connection to Central Battery System Series CBS or other qualified source 12V- 24 VDC. AC= Remote for connection to AC 120/277 supply. • Dual function operation for night or security lighting as well as emergency lighting. • Very low power consumption in night/ security mode. This unit offers tremendous energy savings when compared to any fluorescent or incandescent lighting systems during night operations. • Over 50,000 hour lamp life in normal use. • Lamps are connected in parallel. If one lamp fails, one or more lamps will continue in operation. • Universal 120/277 VAC input for standard battery or AC unit, or 24 VDC input for remote configuration. • Power supply delivers regulated current and voltage to LED lamps at optimum levels to maximize lamp life. • Automatic battery diagnostics available for all battery models. • Manufactured and tested to UL Standard 924 and NFPALife Safety Code 101.
details see product catalog technical data section.